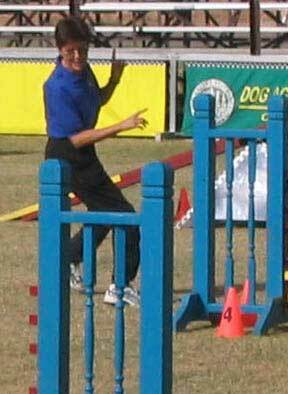 I started my first dog in agility training in 1998, began competing in 2001 and became an agility instructor in 2006. The Passion to have fun with my dogs in a competitive environment has maintained my enthusiasm over the years for the game of dog agility. After watching agility on TV and seeing how much fun the handler and the dog were having I immediately began my search for a place to train. Once I saw how exciting competing could be I packed up my little papillon and off to the trails we went. My agility partners over the years have brought me much joy. Together, our goal of having loads of fun as well as earning some coveted Champion titles was realized beyond my wildest dreams. My first agility dog a Papillon, Crystal, was a two time national finalists in the United States Dog Agility Association’s (USDAA) Steeplechase national tournament in 2002 and 2003 and earned the title of Agility Dog Champion (ADCH) in 2004. Crystal is now waiting at the Rainbow Bridge. Wicket, a Border Collie rescue became a five time champion; USDAA ADCH, BRONZE ADCH and PERFORMANCE DOG CHAMPION (PDCH). 34 titles overall in USDAA. AKC MACH 1 AND MACH 2. Chance, a border collie/cattle dog mix is currently training and will soon be hitting the competitive trail. Becoming an instructor has allowed me to share the joy of agility with others. To provide my students with the most up to date information and training I actively compete in serveral different organizations (USDAA, AKC, CPE) and attend seminars with top agility handlers and instructors. I welcome you to CM STREEK Agility Training Center, Inc. where agility is always FUN!